FingerFiddle introduces a new and highly sensitive musical experience with your IOS device. Your actions on the screen are turned naturally into an exceptionally realistic and responsive sound, whatever you do. Place your fingers on the fingerboard to change notes. Move your other hand on the screen to rub the strings with the bow and shape the sound continuously in real-time. Pluck the screen to play pizzicato. FingerFiddle responds accurately to your movements and lets you play with the full palette of violin expression, just like with a real instrument. Getting tired of playing always the same instrument? Wanting to try something else? Switch easily to another instrument! 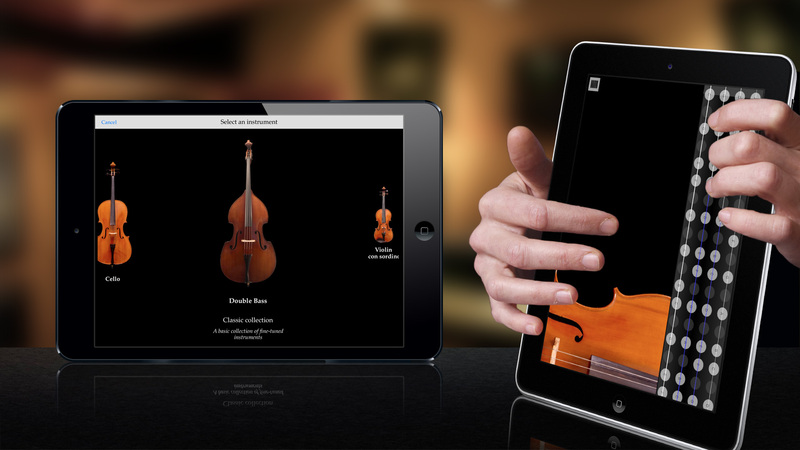 FingerFiddle includes a full collection of fine-tuned instruments from the violin family (violin, viola, cello and double bass). The free version comes with a cello, and other instruments are available to try and purchase. FingerFiddle is a musical instrument that you can bring with you everywhere to play, practice, have fun and perform with others. When travelling, or jamming with friends, or late at night, wherever you are, at any time, pick one of the instruments and play music for real with FingerFiddle. - For advanced players, FingerFiddle is a new instrument to discover and have fun with. Use it in your musical productions and live performances, when jamming with others, or just to sketch ideas. - In both cases, FingerFiddle is a musical instrument that is always right at your fingertips, whenever you feel the need to play music.